That’s the Smoke Shack, a burger with bacon, cherry-pepper relish and the familiar Shack Sauce. It’s delicious, no doubt, and you’re never going to hear me say there’s anything in the world that shouldn’t be baconed. 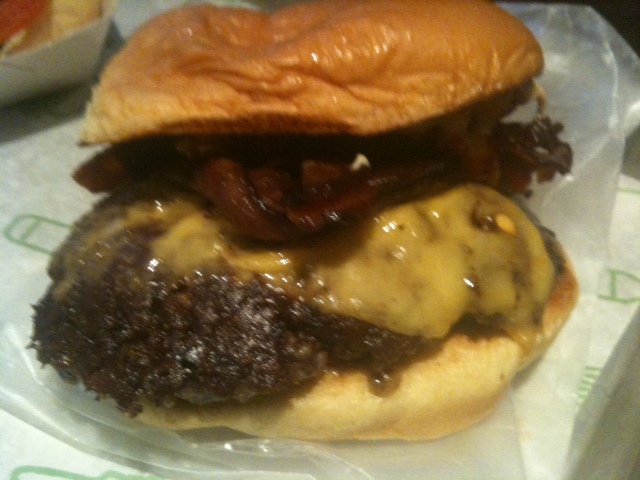 But the entire experience confirmed my suspicion that bacon is not really necessary on the Shake Shack burger. The bacon was bacon — though it was a little thick to be perfectly crispy like a great burger-bacon, to be honest — and added delicious bacon flavor. But the best innovation here, I thought, was the cherry-pepper relish, which added a spicy kick that went well with the sweet, creamy Shack sauce. Straight up, if I ate a Shackburger every night for dinner and then one day I saw this on the menu I’d be all, “oh sweet lord, a change-up!” and order it. But as long as I’m doing everything I can to resist eating a Shackburger every night for dinner, I don’t really need that taco Doritoed, if you know what I’m saying.